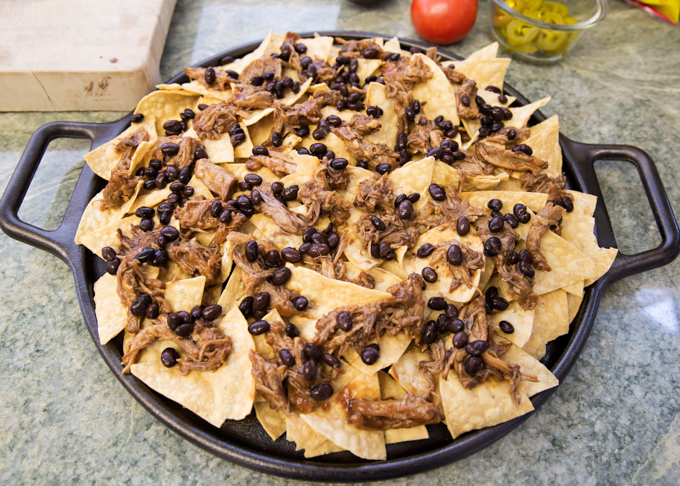 If you’re a fan of nachos and pulled pork, you are going to love these Pulled Pork Nachos! 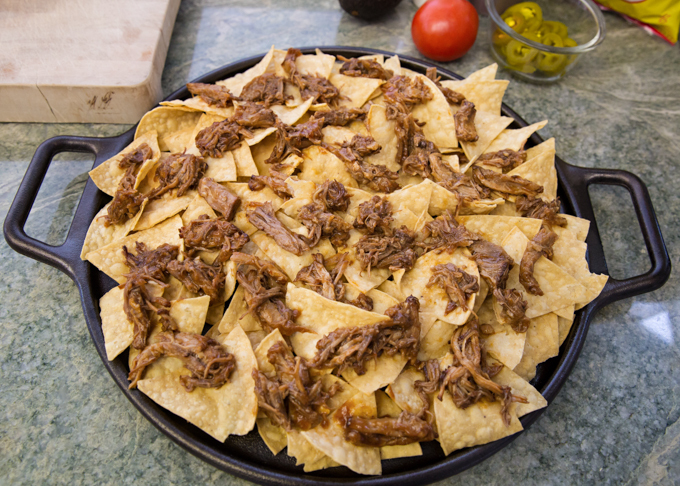 I highly recommend you make a big pot of pulled pork, enjoy Pulled Pork Sandwiches one evening and a big platter of nachos a day or two later with the leftovers!! 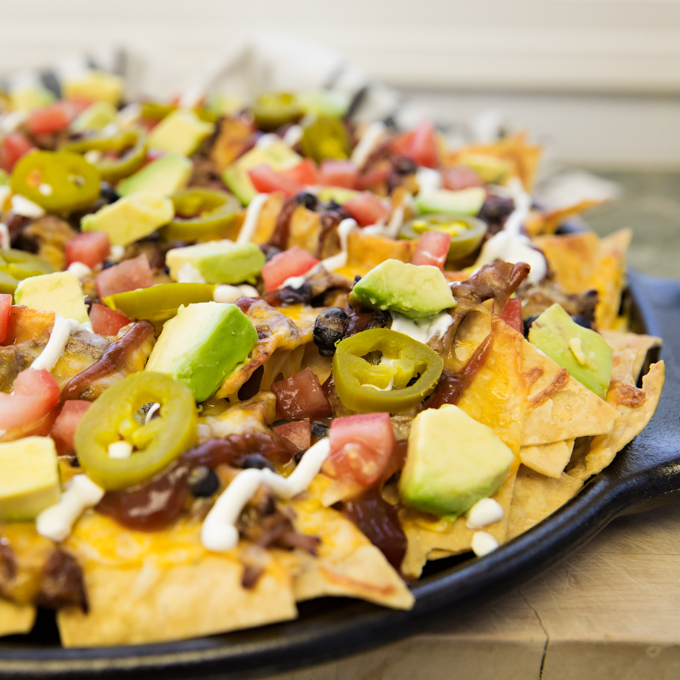 Nachos are perfect any day of the week, and are always a family favorite, but with Super Bowl coming up, these are falling into the must make category!! I’m just getting on the Instant Pot bandwagon and decided to give it a try to make this pulled pork. It was amazingly quick (compared to my slow cooker method) and turned out delicious!! Check back soon for the IP recipe! In the meantime, you can use my slow cooker recipe. 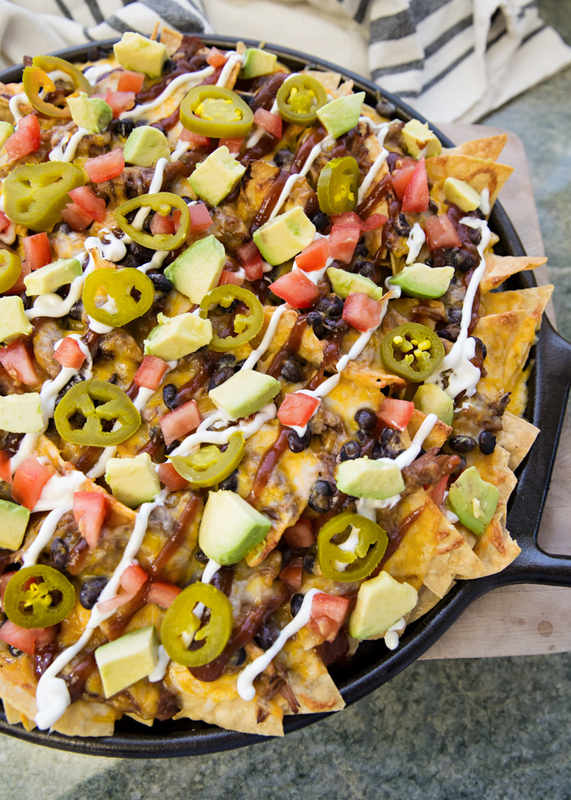 I don’t know what it is about nachos, but I seriously love them!! 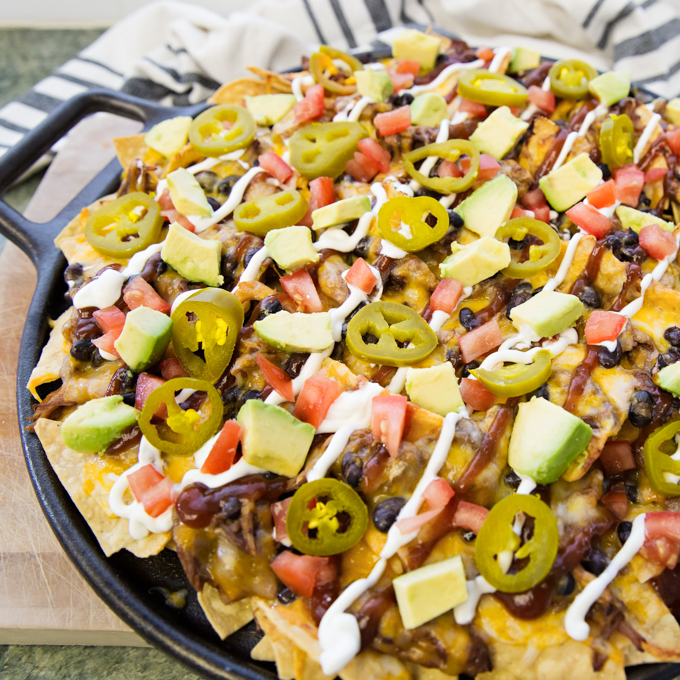 To make these Pulled Pork Nachos, I used store bought tortilla chips, black beans, cheese, BBQ sauce, sour cream, pickled jalapeños, avocado, tomato, and of course pulled pork. I like to warm the beans and pork up before I start layering it onto the chips. Pre-warming guarantees that everything gets heated evenly and the cheese melts perfectly without anything getting a little too charred in the oven. This is the pan I used. 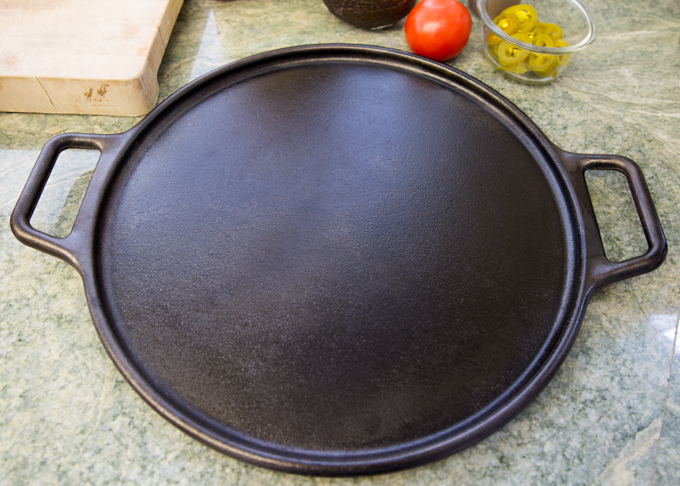 It’s a Lodge 14″ Cast Iron Pizza Pan and is great for both pizza and nacho making!!! 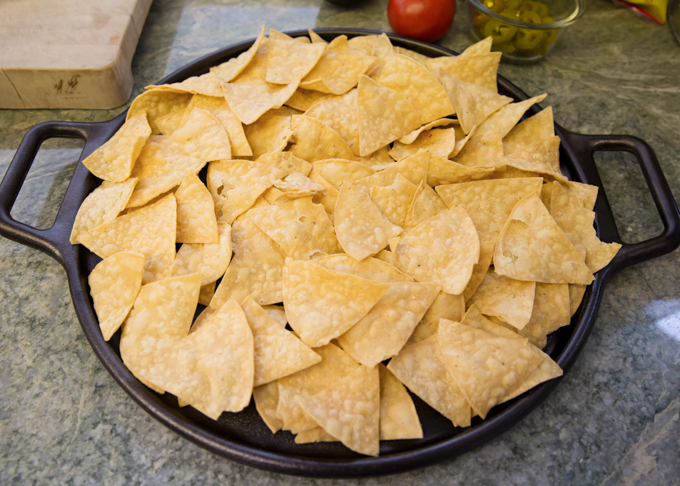 First, you layer on the chips (I did probably a layer and a half). Now, add the warmed Pulled Pork. I try to evenly disperse the ingredients so that every bite is full of flavor! Next add some black beans. 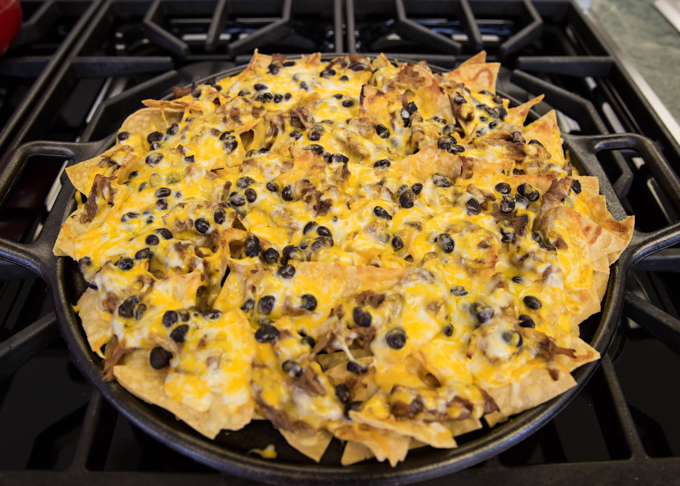 And of course, you can’t make Pulled Pork Nachos without a lot of grated cheese! Straight out of the oven, they’re looking pretty good! But, we’re not done yet! Let’s add a drizzle of BBQ sauce! I also added a drizzle of sour cream, but somehow didn’t get that picture. This is when they get really good!! 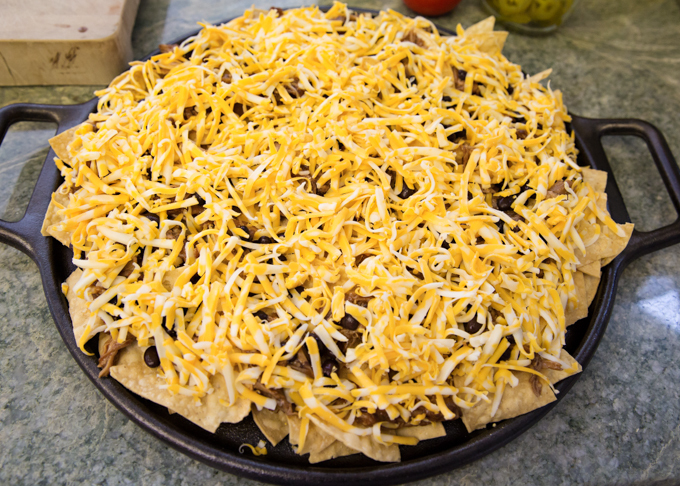 After the bbq sauce and sour cream, top with all your favorite nacho toppings!! I used diced tomato, fresh avocado, and pickled jalapeños. 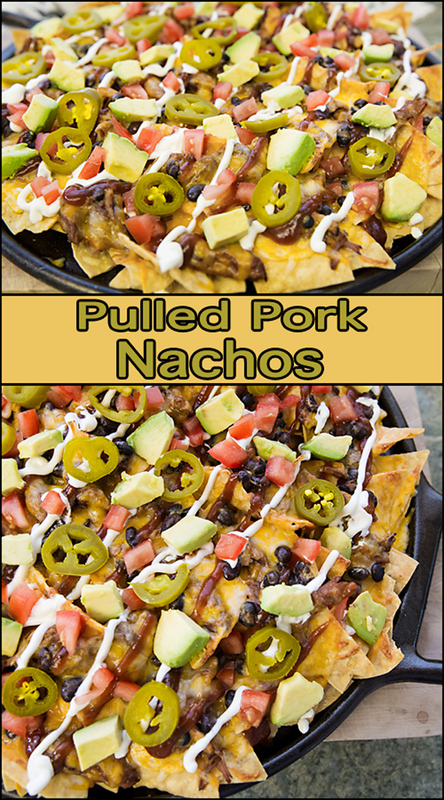 You’ve got to give these a try, and see taste for yourself how delicious these Pulled Pork Nachos are!! These will be perfect to make for Super Bowl!! I guarantee your friends and family are going to love them!! 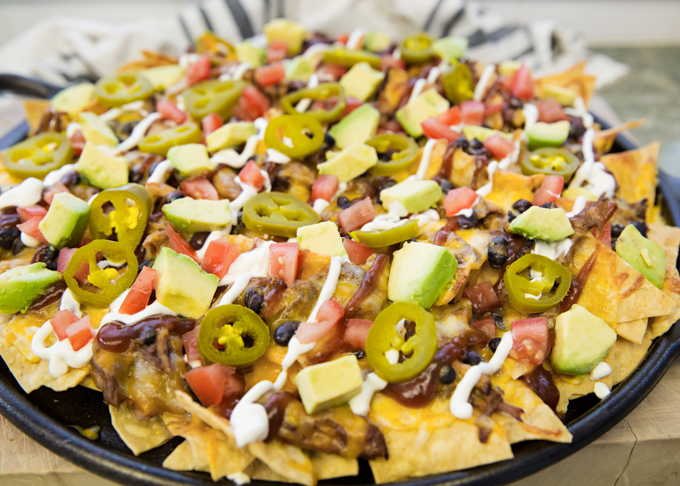 So, head to the store and get all ingredients to make these nachos! 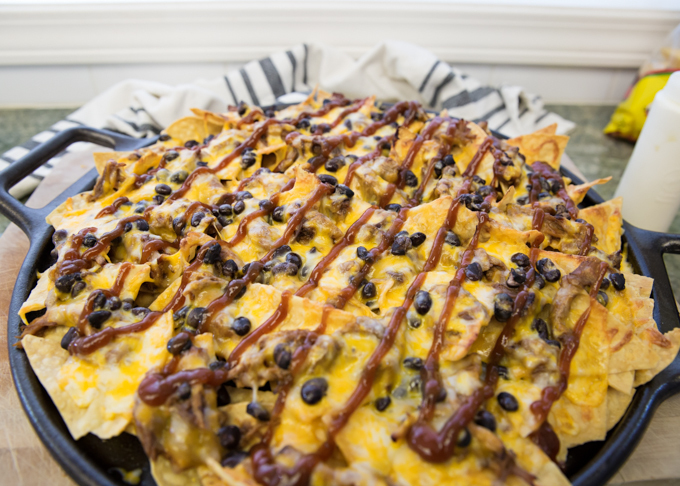 I suggest, making the pulled pork the day before you plan on making the nachos, then simple reheat it with a little extra BBQ sauce before you assemble the nachos. Will you be watching the game? Who are you cheering for? For me, it’s always about gathering with friends to watch the game and good food! Here’s a few other recipe ideas that are sure to please your friends and family! **depending on the size of your pan, above ingredient amounts will vary. Ingredient amount are going to vary depending on the size of the pan. Don't worry if you don't have the same cast iron pan, I've also used a baking sheet lined with foil. Place pan in oven and bake for approx 10-15 minutes or until cheese is nice & bubbly. In addition, you my place under broiler for a few minutes after baking for a little more crisp. Watch it closely so it doesn't burn. Remove from oven and top with additional toppings: bbq sauce, sour cream, diced tomato, diced avocado, and pickled jalapeños. *I used a squeeze bottle for the sour cream and bbq sauce, but it's not necessary to do so. Serve them onto individual plates or gather around the baking pan 🙂 Enjoy!! And of course, be a friend, and please give this image a PIN for me!! Love your great blog! You did a great party job when the kids were in elementary school and I’m happy to see that you are continuing.